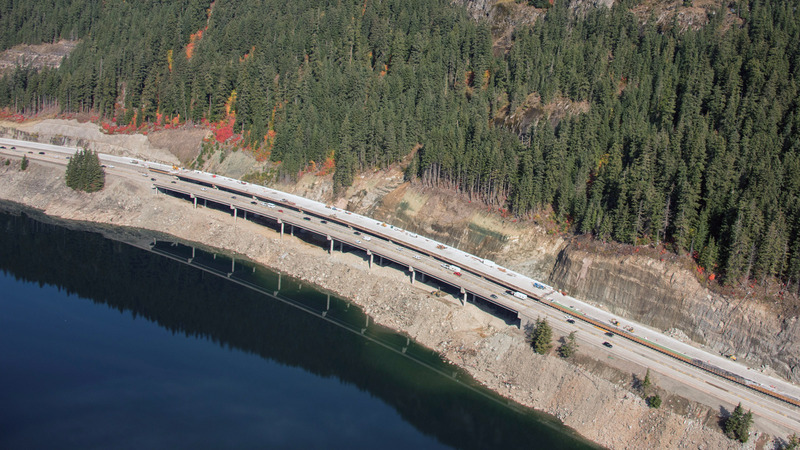 Soon your commute across I-90 Snoqualmie Pass will look a little different. The week of Nov. 6 we will be switching the westbound lanes onto the second, new avalanche bridge. The first avalanche bridge was completed in summer 2016. This configuration will provide three lanes going westbound and two lanes going eastbound over the bridges. Although this is a new look, it’s not the final look. The completion of the avalanche bridges is part of the larger 15-mile improvement project on I-90 between Hyak and Easton. This seven mile section between Hyak and Price Creek has been under construction since 2010 and by next fall most of the major construction will be completed. The remaining eight miles of the corridor between Price Creek and Easton is scheduled to begin in summer 2021. Westbound traffic will be switching onto our second new avalanche bridge on I-90 Snoqualmie Pass this November. This summer contractor crews poured more than 4,000 cubic yards of concrete for new bridges and structures, poured more than 5,700 cubic yards of concrete for the new roadway and removed more than 234,000 cubic yards of material. 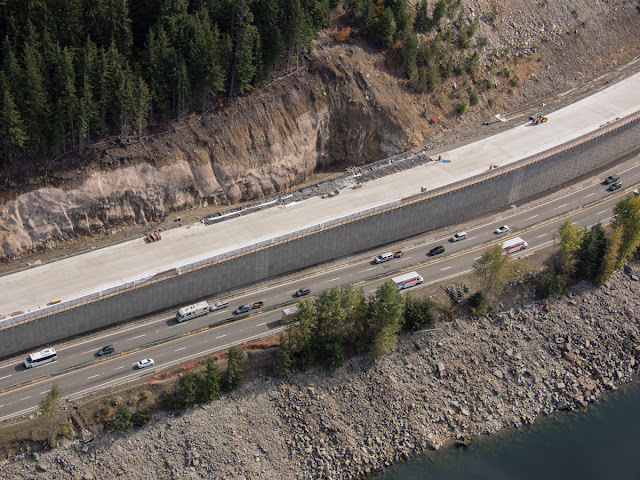 Due to the work to get the new westbound lanes onto the new avalanche bridge, you will still see some delays and backups along Keechelus Lake, so it might be good to give yourself some extra travel time next week. New westbound lanes across I-90 Snoqualmie Pass are just about ready for traffic. The new look across I-90 continues between North Bend and the Summit of Snoqualmie Pass. This summer contractor crews replaced approximately 2,500 square feet of deteriorating concrete panels and milled about 88,000 square feet of roadway in the eastbound lanes. Crews also removed approximately 15,000 square feet of deteriorated concrete from the bridge decks in the westbound lanes. Although this project is finished for the season, crews will be back next spring to finish the eastbound lanes and the westbound bridge decks. Near Cle Elum, contractor crews spent their second summer repairing and replacing a nine-mile section of the westbound lanes. Now you are driving on a smoother surface, which is expected to last the next 50 years. 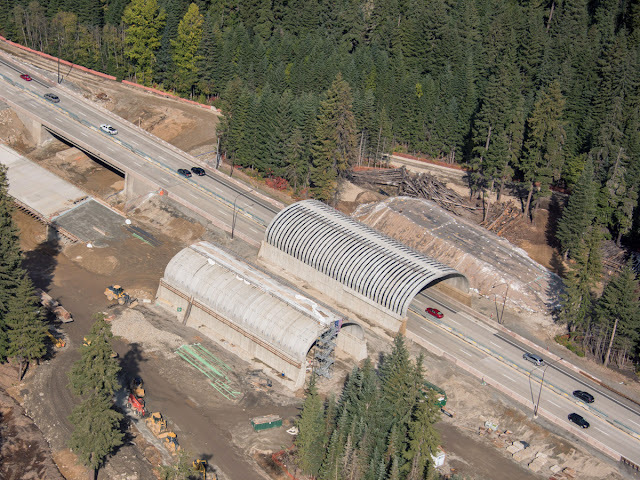 The second arch for the I-90 wildlife overcrossing is in place with the full structure set to be complete in 2019. Contractor crews also spent the good portion of the summer repairing several bridge decks near Ellensburg and building a new roundabout at the US 97 and Dolarway intersection. We know traffic wasn’t easy during this very busy construction season and we want to thank all of you who traveled across I-90 for your patience and understanding. We also want to thank the Washington State Patrol troopers who helped to keep drivers and our employee’s safe through the construction work zones.